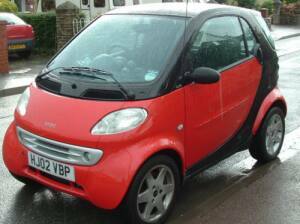 Description of car for sale : Smart 2002 O2 ForTwo Automatic petrol Red/Black £5,100 14,000 miles, "Smart Fortwo. 14000 Miles. RHD Red/Black. Pulse Model Upgraded With Air Conditioning And Triptronic Gearbox. E\W, R\C\L, Cd Changer, Glass Roof, Excellent Condition"